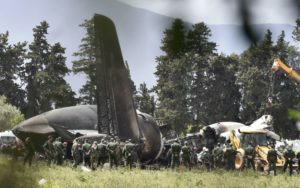 Algeria’s civil and especially military authorities have done everything to trivialize the presence of some 30 Polisario Front soldiers aboard the Algerian Air Force plane that crashed on Wednesday morning few minutes after take-off from Boufarik Air Base, 25 KM south of Algiers, killing all 257 people onboard. In a first official statement on the victims of this accident, the Algerian Ministry of Defense mentioned the 10-crew members and 247 passengers “most of whom are personnel of the National People’s Army as well as members of their families”. But the statement did not mention the presence of the 30 members of the Polisario who perished in this accident. Meanwhile, the Polisario leadership and the front’s representative in Paris confirmed the presence of 30 Sahrawis among the victims. They, however, specified that they were all patients, men, women and children, returning to Tindouf after receiving medical care in Algerian hospitals. According to Oubi Bouchraya, the Polisario representative in Paris, the victims are “Sahrawi nationals, civilians, students, and patients with their attendants who were treated in Algiers”. Two Polisario soldiers were among the passengers, he said. Meanwhile, some media, quoting reliable sources, report that the Polisario members onboard included Mohamed Laghdaf, aka “Bujumbura”, known to be one of the “Polisario security strong men”. Sheikh Doua Ould Boussif who occupied, during his lifetime, several key positions in the front, including that of member of the Front’s representation in Algiers and head of the Sahrawi Red Crescent in Algiers and Oran was also onboard the plane. Anyways, the presence of Brahim Ghali’s men aboard an Algerian Air Force plane is another irrefutable proof of Algeria’s involvement in the Sahara conflict and deflates the claims of neutrality that Algerian leaders continue to proclaim.